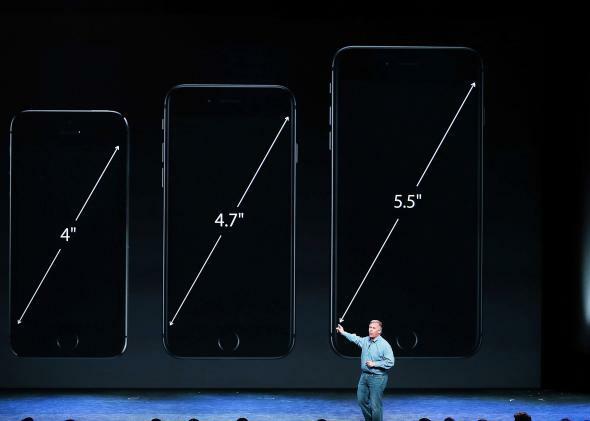 iPhone 6, iPhone 6 plus: Apple decides Steve Jobs was wrong about size. Apple CEO Tim Cook announces two phones that Steve Jobs would have considered unwieldy. 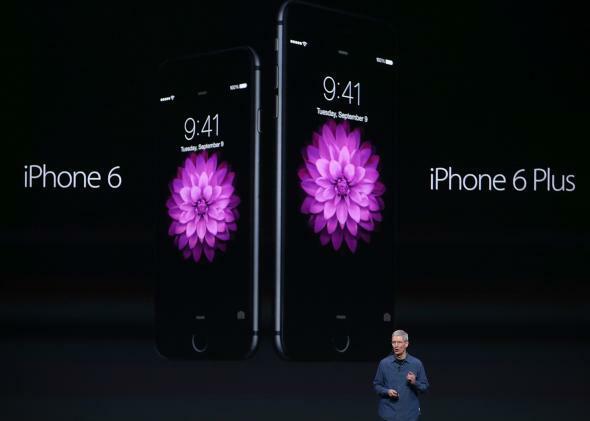 The iPhone 6 is here—and so is the iPhone 6 plus. At a launch event in Cupertino on Tuesday, Apple revealed its two newest pocket computers. The iPhone 6 has a 4.7-inch screen that is significantly larger than the 4-inch display on the iPhone 5 and 5S. And, as its name implies, the iPhone 6 Plus is bigger still, with a 5.5-inch screen that approaches the size of so-called “phablets” like Samsung’s 5.7-inch Galaxy Note. To take advantage of their larger screens, Apple’s new phones are designed to be held horizontally in many cases. Some apps will reveal a second display panel when you turn the phone on its side. And for the first time, the phone’s home screen will rotate to accommodate a horizontal posture. Apple CEO Tim Cook called the new phones “the biggest advancement in the history of the iPhone,” which sounds like quite a claim until you realize that (a) it’s partly just a reference to their size, and (b) Apple executives always heap superlatives on their new devices, even when they aren’t particularly revolutionary. Screen size aside, the new devices look like about as much of an advancement over last year’s models as you’d expect. Both are not only larger than their predecessors but pack in more pixels, resulting in what Apple calls a “Retina HD display,” with resolutions of 1334 x 750 pixels for the 6 and a legitimately impressive 1920 x 1080 for the larger 6 Plus. Both have the capability to record high-resolution, 1080p video at either 30 or 60 frames per second via a front-facing 8 megapixel camera. On the 6 Plus, that camera comes with optical image stabilization to better compensate for your shaky hands. 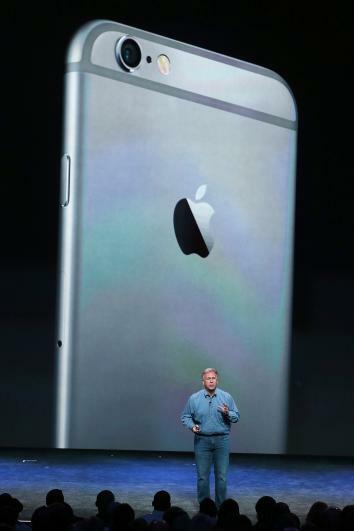 The new iPhones have a screen with glass that curves around the edges, and an anodized aluminum back panel. Both phones are also somewhat thinner than the 5S, at 6.8 and 7.1 mm, respectively, versus 7.6 for the previous model. Their glass screens go all the way from one side of the phone to the other, creating almost an infinity-pool kind of effect, with the glass curving at the edges. They’re good-looking phones. Apple claims the new phones’ battery life will match or exceed that of the 5S, which would be impressive if true given their size. The new releases are in keeping with Apple’s recent history of releasing new hardware whose greatest improvements lie in their technical specifications rather than entirely fresh features. The strategy has been working so far, with global iPhone sales reaching new heights in the past year, although it has led to some grumbling from those who expect magic and miracles every time out. The new iPhones will be available starting on Sept. 19. If you’re buying them on contract, prices will range from $199 to $399 for the 6 and $299 to $499 for the 6 Plus, depending on the amount of storage you desire. Without a contract, they’ll be exorbitant as always. This image shows the screen sizes of the two new iPhones (middle and right) alongside that of the previous model (left). It’s true that “phablets” aren’t for everyone. Still, Apple’s rivals have since proven that larger screens hold plenty of appeal in an age where people do more and more reading, typing, and movie-watching on their phones. You can work all the technological wonders you want, but when it comes to screen size, bigger is simply better. The only question is whether it’s worth the tradeoff in terms of portability. Back when people used phones mainly to make calls, Jobs was probably right to go small. It’s hard to say whether he would have changed his mind if he were still alive. But Apple clearly has, and that’s not a bad thing. With the 6 Plus, Apple has at least tried to help out the small-handed with a new feature that brings the top buttons partway down the screen when you double-tap the home button. I expect the larger phones will be a hit, just as all of Apple’s previous phones have been (with the possible exception of the desultory 5C.) But it will not escape the notice of the gadget-savvy that, after years of accusing Samsung of copying its phones, Apple’s newest offerings are following a path that Samsung helped to blaze. The phones, by the way, were not the only thing Apple introduced on Tuesday—and the other is far more ambitious. It’s called the Apple Watch, and I’ll have a separate post on it shortly. Until then, you can find the basics here. Update, Sept. 9, 2014, 3:41 p.m.: This post has been updated to reflect information that was announced after its initial publication. Is It Time to Buy a Smartwatch?